I love how this turned out. It’s blue so he can wear it to school. It’s simple but not just straight stockinette. It fits him perfectly (almost too perfectly) and is done just in time for a week of cool temperatures. I liked the yarn (I used Spud & Chloe Sweater in Moonlight) though if I had to do it over again, I think I’d go with a wool instead of a wool and cotton blend. I really am not a fan of knitting with cotton or how cotton looks knit up but I didn’t know that back when I bought the yarn for this sweater (about two years ago). The button came out of my stash but it’s from Wooly Moss Roots which has some great wooden buttons. It is a bit thick which I’m not crazy about, but it’s the one I have that fits through the button hole. First off, the sweater is amazing! 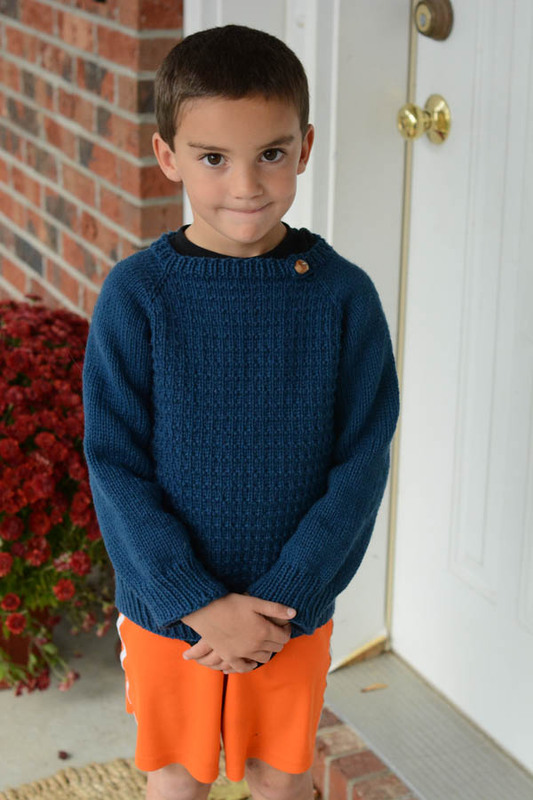 I love the stitch pattern on the front, and it looks so good on your son! I’m thinking it’s a top-down knit? 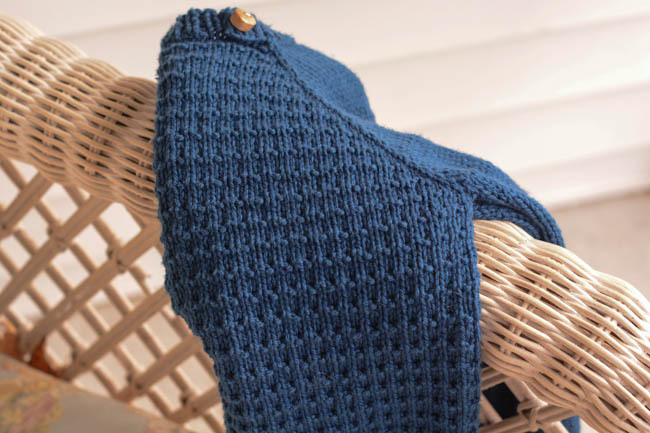 I loved making top down sweaters for my kids, and one of my favourites was for my now-17 year old son and was this exact blue, and was also a cotton/wool blend. And yay, you’re listening to NPR while you’re knitting! I remember listening to Wait, Wait Don’t Tell Me when we lived in the States 🙂 . My husband and I just motored through season 3 of Mr. Selfridge (we had a week to get through the entire season because I borrowed the DVD from the library as Netflix only has seasons 1 and 2) and after that binge-fest I was DETERMINED to get some quality knitting time in (which for me means no TV) so the other night I had a very enjoyable couple of hours listening to CBC, our Canadian public radio, while I worked on another hat (but this one’s for me 🙂 ). Thanks, Marian! It is a top top down. The only other construction I’ve ever tried is over the top and I’m not quite sure I’m liking how that is turning out. I STILL need to look up Mr. Selfridge from the last time you recommended it. I think I’m going to try and find the Serial podcast as well. Every one I knew was talking about it a few months back and I just never got on the bandwagon but I really do enjoy listening to things while knitting instead of just watching TV. I don’t feel like my brain is going to fall out of my head that way! Love it–and that look on his face in the first photo. It says so much about being a boy that age. The sweater is beautiful. It reminds me so much of the ones my grandma used to knit for me. I remember especially a beautiful sherbet-green cardigan that was so soft, and has the most adorable buttons. I can’t remember the buttons exactly now–I think they were in the shape of different animals?–but I remember that the buttons were what made me love the sweater. Then, I remember being a teenager and helping her pick a pattern, then going to the yarn store with her to pick out the yarn I liked. She wanted to make sure it was a sweater I would like. So much love in her work–and I can see that in yours, too. Maybe this winter I will actually make some progress as a knitter. You certainly inspire me. Oh Rita, the story about your grandma made me smile so wide and get a little a misty too. I DO love knitting things for loved ones. 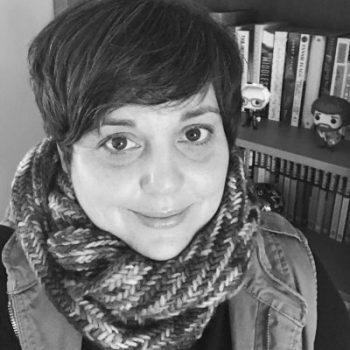 The Yarn Harlot wrote something on her blog (not so) recently about how knitting takes time and during that time you think about the intended recipient and then you give it away to wrap them up with all your love and hopes and wishes for them. I love that. I love that a gift that is practical and useful (especially in a Wisconsin winter) can also be extremely sentimental and symbolic. There’s a special kind of magic in that. I started doing some knitting last winter, and I found it very soothing. I’m pretty sure I will pick up needles again soon. There are many, many gifts I don’t remember, but I think I remember all the gifts I’ve been given that someone made for me. I’ve found the same thing. 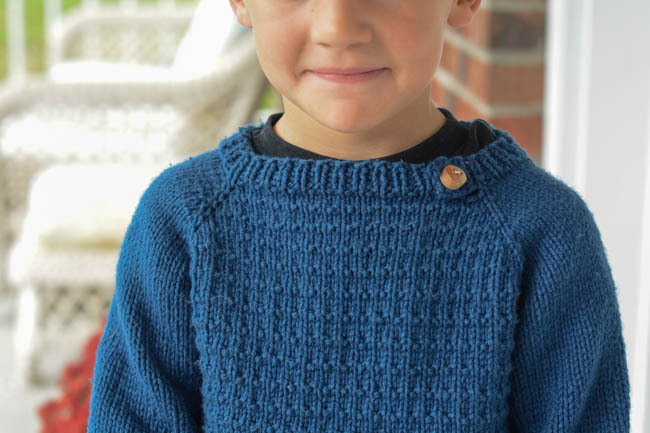 I have LOTS of sweater ideas for my daughter but unless I want a shawl collar cardigan, there isn’t anything I need for little boys.